* Some restrictions apply. Not valid on Youth Memberships or Temporary Memberships. Member must be in good standing to participate in the NIFS member referral program. 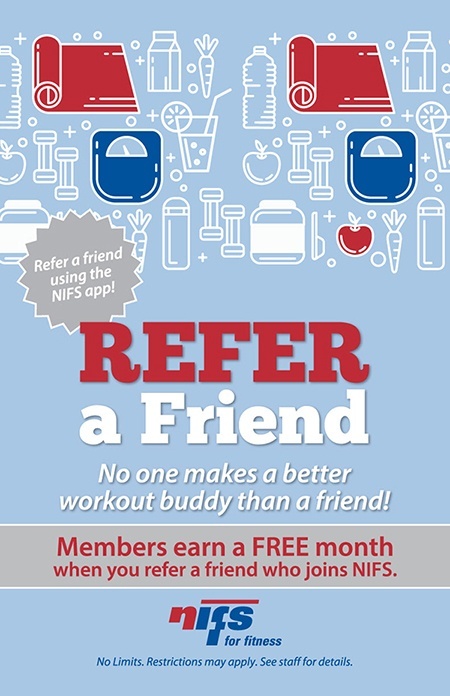 Use the NIFS app for electronic referrals. If using a Referral card, the name of referring NIFS member must be presented at time of sign-up on card. All referral credits will be applied to your NIFS account. No cash value. See a membership representative for more details or call 317-274-3432 ext.279. Or email membership with your questions. Want to Bring a Friend for Free? The first Friday of each month is a FREE guest day for our members so mark your calendar and invite your friends, family or coworkers to join you for a great workout! Or share our 7-Day Trial Membership Offer with your friends, family and coworkers or on your facebook timeline. Questions? See a membership representative or call 274-3432 ext. 279. Or contact us by email. Carmel 620 Station Drive (Keystone and 116th - Merchants Square) (317) 844-1558; Fishers 14033 Mundy Drive, Fishers, IN 46038 (SR 37 @ 141st. St. - Next to Uncle Bill's Pet Store) (317) 773-7108. Green B.E.A.N. Delivery, 20% off discount for 3 separate orders. Use promo code NIFS at checkout, (317) 377-0470. Download flyer.